1. Wash the rhubarb and chop into chunks about an inch thick. Place the rhubarb in a saucepan with the sugar, orange juice and orange zest, and cook over a medium heat. 2. Heat until the orange juice starts to bubble, and then turn down to a low heat, letting the rhubarb simmer for 5-15 minutes until soft. It won’t take long to cook through if the rhubarb is ripe but it should be enough time to prep steps 1 and 2 of the crepe batter: follow this link to access the Little Pancake blog. 3. Many stewed rhubarb recipes suggest adding water to the fruit but this usually makes the mixture too wet. If needed, add 1tbsp of water but it’s best to allow the fruit to release its own juices first. 4. Once cooked, stir through the Sloe syrup and set aside the rhubarb. Now onto the crepes: follow this link. Here comes the summer... Let's have some cupcakes topped with Grenadine icing.. (you can use any of the syrups). For all the cake makers out there, my friend Denise Godbolt has created the perfect balanced recipe for flavoured icing. The measurements are perfect for 30 cupcakes and all flavours in the Blossoms range work wonderfully. Beat the soft butter and the sugar together. Add the syrup and Voila! Preheat the oven to 230C/210C Fan/Gas 8. Grease the ramekins with butter, then dust the insides with a coating of sugar. Whisk the egg whites in a clean bowl until firm peaks form when the whisk is removed. Fold the custard and passion fruit syrup into the whisked egg whites, then spoon the mixture carefully into the ramekins, smooth the tops using a palette knife and place them on a baking tray. Bake the soufflés in the oven for 8-10 minutes, until risen and golden-brown. Combine the marinade ingredients. Coat the salmon with the marinade and let sit for 30 min. 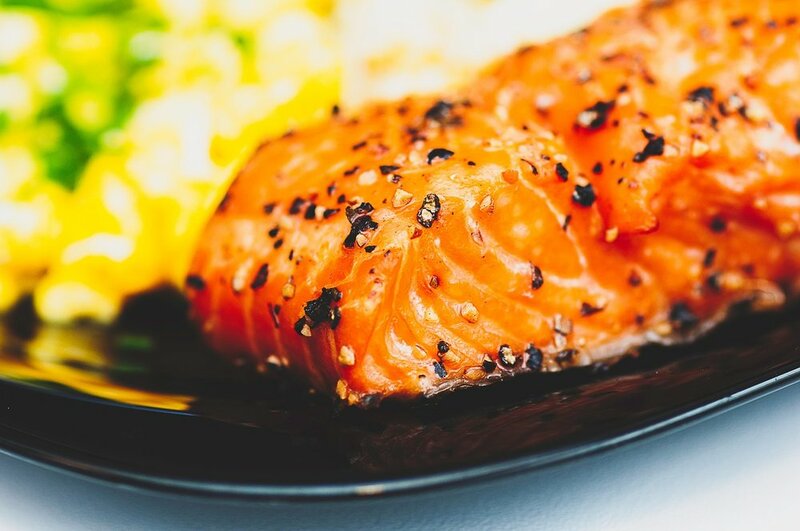 Grill the salmon to your taste. Toss all of the ingredients together in a bowl and serve. Sesame seeds and spring onions for topping. Cook in pre-heated oven for 30mins at 180°C. Sprinkle some sesame seeds and spring onions before serving with steamed vegetables. Slice the pineapple with a mandolin, place flat on serving plate, drizzle Blossoms Pineapple syrup over slices, cover and refrigerate for few hours. Sprinkle with some fresh chopped mint and serve.